Helen Newman is co-founder of Sea Sanctuaries Trust and a marine biologist. She worked in Raja Ampat as a consultant to Conservation International for the 4 years. Helen has extensive experience in environmental impact assessments, public aquarium operations and ecotourism developments. Helen has been working in Asia for the last 30 years and is currently based in Bali. Simon Day is co-founder of Sea Sanctuaries Trust and a British qualified lawyer who has lived and worked in Asia for 14 years. Simon, whose first degree is in Biological Science has experience in the establishment and operation of large conservation programs. He is a partner in a liveaboard dive boat which is based in Raja Ampat. Dr Mateus Baronio is a biologist with extensive experience in environmental management and research. He is experienced in use of a Micro Remotely Operated Vehicle as a tool for studies of shark behaviour and diver impact and has conducted a wide range of environmental assessments. Steve Woods is a prominent marine photojournalist dedicated to the conservation of the seas. He has had great experience working for the UK national press for many years as well as working on various other conservation projects. Whitney Anderson is a coastal and marine resource management advisor. She has advised the Palauan Government in the design of fisheries management schemes and works closely with Palau’s Reef Management Program in community-based resource management programs. Matthew Clugston help us with all our digital efforts. Matt works on our website, social media, videos, & everything else connected to everything else! Ian Burman is a Partner of Laytons, solicitors based in London and he heads the firm’s Charities group. Ian specialises in Charity law including trading and commercial activities & Charity tax planning and sits on the board of trustees of a number of charities. Ian is a keen diver and sportsman and lives near London. Andrew Collins is a consultant to Laytons and has more than 40 years corporate law experience in the UK and abroad. He has co-authored two legal textbooks and has also held a number of non-executive directorships. Andrew served in the British Territorial Army for many years and is now Chairman of Association of his former Regiment. He also served as Master of the Worshipful Company of Fanmakers and was one of Her Majesty’s Commissioners for Taxes from 1983 to 2005. 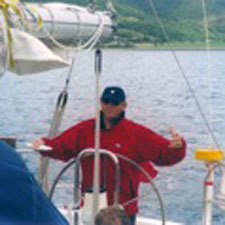 From an early age he took a keen interest in sailing and has cruised extensively and also raced yachts in the UK and USA. He served as Rear Commodore of the Royal Thames Yacht Club, is a trustee of a maritime charity and is involved in raising money for Olympic sailors. John Rugg is an engineer with a long career in British industry, most of it spent with ICI. He has a wealth of business experience in sales, marketing, export, trading, logistics and process management. After retiring from ICI John acted as Regional Chairman of The British Horse Society and sat on the Boards of the Not For Profit organisations ‘Excellence Northwest’ & the ‘GX Sailing Association’. His main interest is sailing and whilst no longer racing, he skippers his own yacht in the UK and northern European waters and charters abroad for coastal and offshore cruising. He has an interest in the marine environment and enjoys good food, wine and company.